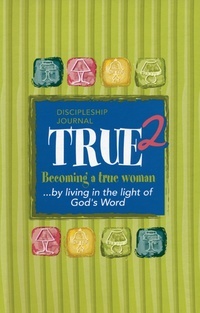 True 2, the second year of the Biblical Foundations for Womanhood discipleship curriculum for teen girls, emphasizes the necessity of understanding God’s creation design of women in the context of the gospel, encourages girls to live in the light of God’s Word, and examines various aspects of what it means to be a helper. There are 15 lessons as well as instructions for a variety of crafts and activities that support the lessons. True 2 includes topics such as: God’s Word, God’s Gospel, God’s Design, A Helper Defends, A Helper Comforts, and A Helper Sees and Cares. The Journal is a spiral-bound book for girls with Scriptures, outlines, illustrations, questions and assignments for each lesson. The Leader’s Guide (sold separately) adapts specific portions of the text to develop lessons plans for teens; provides answers to the questions in the journal, and gives ideas for crafts, ministries and activities.